The Animal Planet's resident animal expert Dave Salmoni takes the viewer on an amazing journey to Africa as he attempts to save a rogue pride of lions in Namibia’s Erindi Game Reserve. This six month journey immerses Salmoni into the lives of these lions as he takes his camera crew and attempts to integrate with this pride of 16 lions in order for them to gain the trust of humans and ultimately save their lives. Using all his skills as a zoologist and expert knowledge of big cats, Salmoni virtually risks his life to save this pride who are in danger of being exterminated unless they can learn to live in this wildlife reserve and accept humans. However as the documentary progresses, we learn quite early on in the piece that these lions are only doing what is natural to them, fulfilling their predatory roles and unfortunately sharing the land with "humans", especially with their cattle is not ideal. But Salmoni has been called to change this as he explains to reviewers that the life of lions with a touch of laymenism by keeping it "real" as opposed to a top heavy scientific documentary. For example, he describes the male lions lounging around all day which is equivalent of men drinking beer and watching TV. He also names his lions such as Brutus, the King of the Pride or Cleopatra the Queen. In essence, Salmoni creates his own training sessions for the lions and all five episodes of this Blu-ray is a treat to watch. At times, Into the Pride will have you sitting on the edge of your chair as Salmoni builds a relationship with each of the 16 lions and as the days go on, he slowly becomes accepted by these wild animals, even though there are quite a few frightful moments thrown into the piece. For example, in the first episode, he attempts to walk near the lions so they can accept him. Of course, he also carries a crook or a staff and pepper spray as a last defence. It’s quite engaging to watch and Salmoni’s passion definitely rubs off on the viewer which makes this documentary so amazing to watch. To compliment this compelling rescue mission of Salmoni is the amazing cinematography of Africa that is really highlighted on Blu-ray with its Earthy tones and beautiful locales as we follow the story. On Blu-ray, the video quality is rather impressive and almost makes it like you are part of the camera crew from its exceptionally clear video, thanks to this FULL HD presentation. 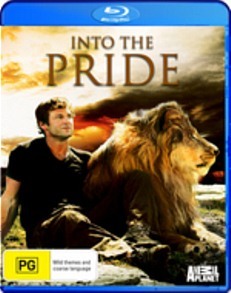 Into the Pride is well narrated by Salmoni that matches the equally good audio which is presented in Dolby Digital. However without the passion behind Dave Salmoni and his love for big cats, this would have been quite a pale and perhaps sensationalised documentary but Into the Pride is far from that.